Ultimate Whey Protein amino acid profile (per 100g of protein). I couldn't find any amino acid information for Ultimate Whey Protein. [Optimum Health] Ultimate Whey Protein review. Summary: Optimum Health's Ultimate Whey Protein is a low-price whey protein supplement, and for that you're getting a low quality product. I wouldn't buy Ultimate Whey Protein. Sure it's cheap and you're getting lots of protein for your money, but it's a poor product. Ultimate Whey Protein contains a lot more sugar and saturated fat than average, and so even though you're saving money you can't feel good about taking this supplement. It's not always the case that cheap = bad, but it is here. If you want a good value for money whey protein, get My Protein's Impact Whey or True Whey instead. Ultimate Whey Protein is like Optimum Health's attempt at MP's Impact Whey, but it's nowhere near as good. This is not a good quality whey protein supplement. It's a poor effort. Aside from the low protein content (71.06g), the worst offenders on the nutrition table are the sugar and saturated fats numbers. Ultimate Whey Protein has a mammoth 13.76g of sugar and 5.51g of saturated fat per 100g of powder, which are both well above average (sugar average = 5.43g, saturated fat average = 2.13g). Compared to other why protein blends containing both whey protein concentrate and whey protein isolate this is one of the worst nutritionally. It's high in the bad stuff and low in the good stuff. If you care about quality you should look elsewhere, like at this list of the best nutrition whey protein supplements. Ultimate Whey Protein is bland and sweet. Instead of creating a flavour that actually tastes like chocolate it seems as though they've shovelled in a bunch of sugar and said "that'll do". I'm sure that if I bought their strawberry or banana flavours they would taste exactly the same with the only difference being the colour. Overall it doesn't taste bad – I'd comfortably be able to finish a shake of the stuff (and I have). However, with all that sugar and saturated fat flying around I'd want something that rivals the ecstasy delivered by my favourite chocolate milkshake, but it doesn't come close. The taste of Optimum Health's whey supplement is what should have helped to set it apart from other whey powders, but instead it massively under performs. For perfect examples of wheys that are able to taste awesome without being loaded up with sugar, check out Pharma Whey and Gold Standard Whey. 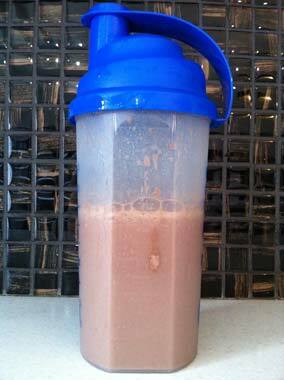 Ultimate Whey Protein Mixability: 50g of powder + 400ml of water. See the clump of powder hanging out on the side? I'm not sure if you're supposed to drink Ultimate Whey Protein or eat it. It's one of the lumpiest shakes on the market. 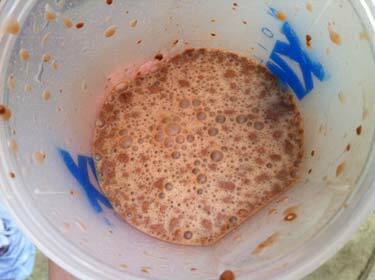 It's not as hilariously bad at mixing as Whey Maxx is, but it's still a pain. I rarely use the grill part of my protein shaker because you just don't need it for modern protein powders, but for this powder I'd be compelled to search for it. Without the lumps the consistency is fine, if not pleasantly thick, but otherwise it's a minefield of chewy slimy lumpy bits. Aside from the obvious annoyance of running in to big lumps in your shake, another big problem is the loss of protein. Whilst you're dodging those lumps you're also dodging globs of protein, so you're going to be wasting some of the protein you've paid for. Not good.